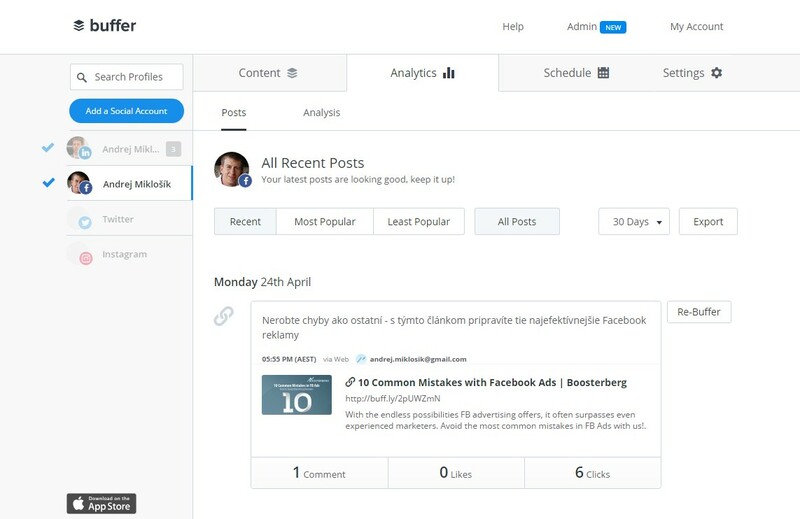 Ready for Some Social Media Management Automation? 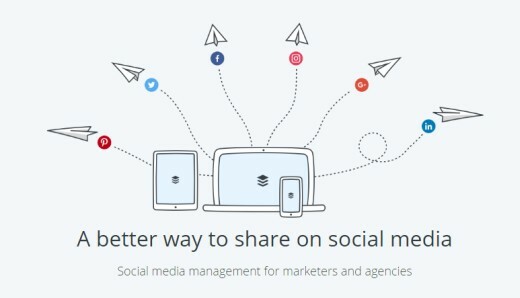 If you are managing social media profiles and pages and do not use any tool for content management, you might be very familiar with the “classic” workflow: You are looking for new content, then you are saving it somehow so you can process It later, then you are posting it to different social media. You have to access multiple locations and login to each of the systems separately. For those, who manage even one social media profile diligently, this can be a quite overwhelming experience. Not mentioning companies that have more social media profiles and digital marketing agencies who manage multiple clients’ social media profiles. The latter mentioned already surely use some content management or content publishing tools. If you do not know Buffer, read this article and get inspiration on how it can transform your work of managing content on social media into pure pleasure and fun. 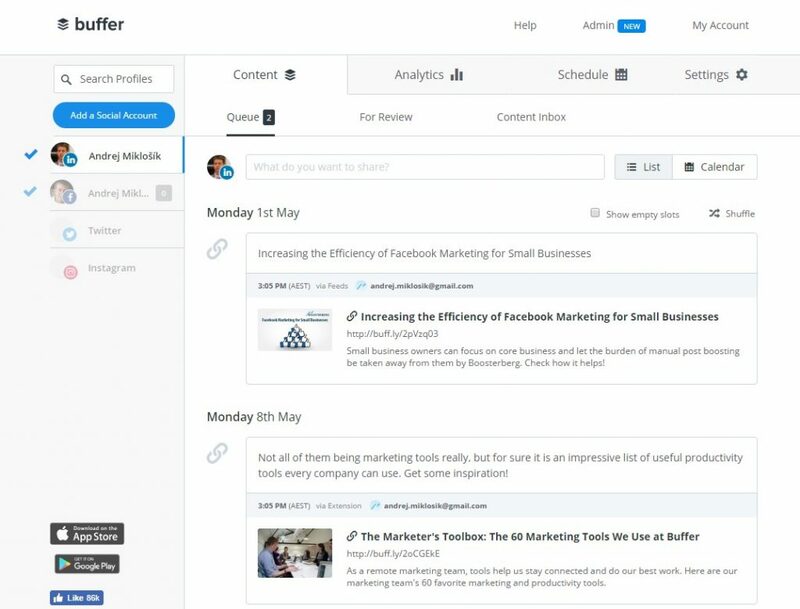 Using Buffer, you create your own Buffer of articles that you will use for content creation on social media. The main benefit of using Buffer is the workflow for discovering, processing, and publishing content to be published on social media. It also comes with complementary features and a lot of useful tools that make your work in social media marketing much easier and pleasant. You can easily discover new content using the browser extension or mobile app, then save the content to your Queue (or publish immediately). After accessing your Queue, you can decide, what to do with the content, where to publish it and when. Also, you can easily connect any feeds to Buffer so you have an overview of all articles published there and you can easily share them. Buffer does offer a free trial for both personal and business accounts, so people who would like to test the features available in the paid plans before paying for the plan won’t be disappointed. The trial is credit card free and it lasts 7 days for the personal account and 14 days for one of the three business accounts. However, if you have already started a free account with Buffer, which is not time-limited, you can’t trial when upgrading to the Awesome plan, so checking the features is a bit tricky – you would need to sign for the trial in a different browser with a different username (signing out and registering for a new trial is possible as well) or you can trial the Business account “you’ll find the option in your “For Review” tab. If you are on the free plan, you can use the free features forever, if they are satisfying your needs. A lot of users will surely want to upgrade at least to the Awesome plan, where you can add RSS feeds to your Buffer to have all the articles from your best sources immediately available for processing. This account comes up to 102 USD with a yearly plan which also increases your Queue limit significantly (from 10 to 100 posts), enables you linking more social media profiles (10 instead of 5) or displays the handy Social Media Calendar. If you’d like to unlock the workflow features or deep social media analytics, you’ll need to look higher and select a plan from the “Business” category – here are three levels available starting at 199 USD monthly for 5 users. The user interface is very intuitive and you surely won’t be lost there. When working with content, you have three tabs available. The main one is Queue, where you find all the content that you saved for later publishing when browsing the internet or you already scheduled it for publishing after reviewing the content submitted by your co-workers. You have to love the Queue: All posts are listed there in the order you have added them and they are scheduled for publishing based on the scheduling rules you have set up. You can set a scheduling rule to post once per day on Monday, Wednesday and Friday at a certain time. So if you have five posts in the Queue, you will see that the first one will be published this Monday, second one on Wednesday and so on. You can easily drag and drop the posts to change the posting order. And your posting rules are pretty flexible, just add days and posting times as you wish. You can adjust them anytime based on the results of Analytics you get. With this, we have covered all three main tabs you will use regularly (Queue, Analytics, Schedule). The forth one is Settings, where you can set the link shortening, manage members, reconnect, empty your queue or remove a social media account. Reconnecting your social media account updates the information in the Buffer app, such as your page name and profile picture. If you are using one social media account, this is pretty much what you’ll do here. The same happens with the second, third (and so on) social media accounts. Again, you have the three main tabs here. So, using this process within each social media account is very easy and it is fun to work with the content. And of course, reusing the content discovered between more social media accounts is possible. The content in one Queue (let’s say for Facebook – or can be Facebook 1 if you have only Facebook accounts connected) is usable in any other queue (let’s say LinkedIn or Facebook 2) – the only thing you need to do is drag the post from one account to another to create its copy. There you can finetune it to look as desired to be published on another platform or account. When your co-workers send you new content and you do not assign full posting privileges to them, this new content will appear in the “For Review” Tab. And the last tab “Content Inbox” is used to connect your favourite feeds. Here, all recent articles published within your associated feeds will appear. You can either dismiss the article or add it to your queue with one click. This is a fantastic way of keeping an eye on your favourite content sources without using any third-party tool. You won’t use this whole workflow when working with the free version, however. Analytics tab offers insides into posts performance. You can filter your posts according to the time published and their popularity. By each post, important stats such as comments, likes, and clicks can be seen. All stats can be exported. Scheduling of the posts is very well processed. 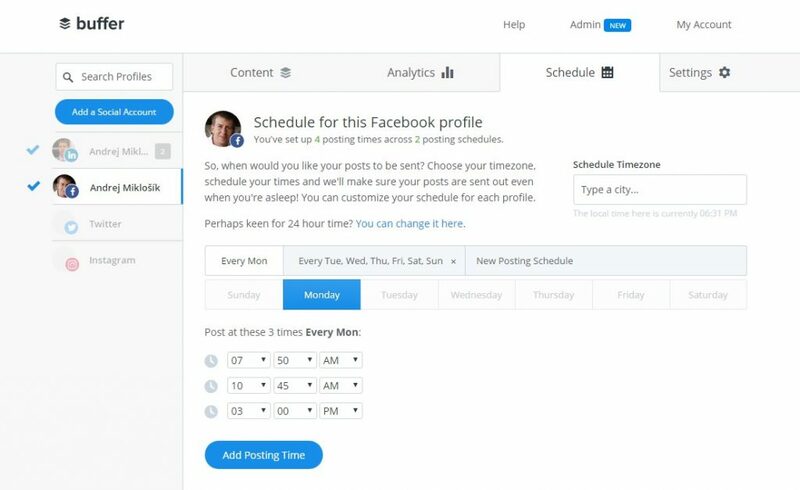 You can set up scheduling rules for every social media. Moreover, you can have more scheduling profiles ready and switching between them is so easy, just click on another tab. So if you have strong and weak season, you can have two profiles ready and when the season changes, decrease your posting frequency with one click. Each post can be timed also individually, publishing time can be set by switching in to the manual mode in the Queue. As we already mentioned, the user interface is just fantastic. Except of the drag-and-drop feature, which is useful in planning the content in the queue or reusing the content in another account, we also love the fact that changes made e.g. to the Scheduling are instantly saved, so there is no need for saving them manually before moving to another tab or feature. And when you add new content either via the browser plugin or just with your mouse through right-click, the Queue “counter” (information about the number of posts in the queue) along with the queue itself is updated without the need for refreshing the page. The same happens when your scheduled time is over – you’ll switch back to your Buffer tab in the browser after doing something else and voila – the post is gone and the second post in the queue became the first one. 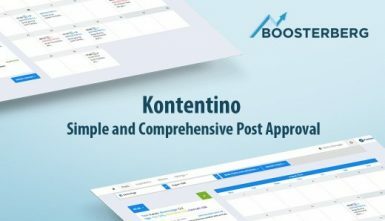 To sum up, with all of these features mentioned, you do not really need any other tool for your content management and scheduling of posts for social media. We can only recommend Buffer and if you are looking for a complementary tool to Boosterberg, this is the ideal choice. 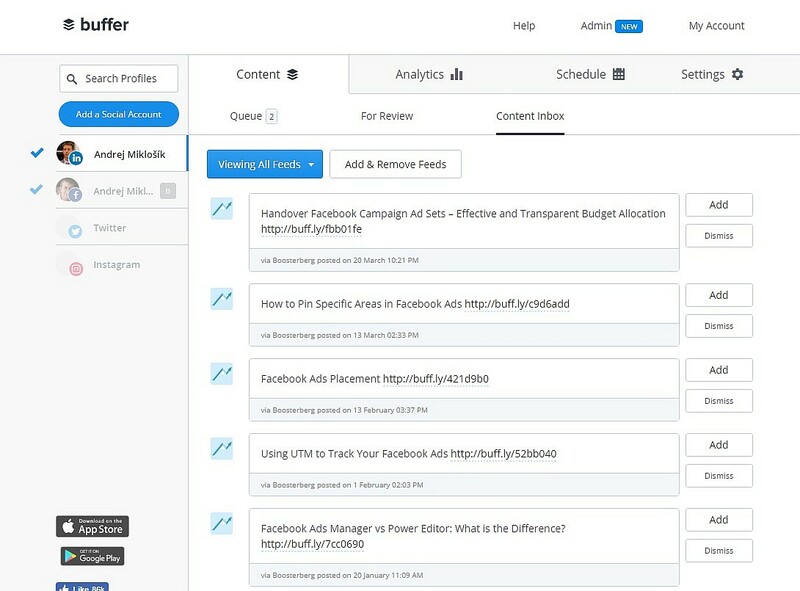 Buffer helps you with content creation and publishing and Boosterberg cares for its promotion on Facebook and Instagram. Content already prepared and scheduled in the Queue. Changes are easily done with drag-and-drop, posts can be manually scheduled here. Currently we have two scheduling profiles ready, the opened one has three publication times per day.